RO BOOKS to release Ascension: The Indigo Project on April 1st worldwide. Redemption, book #2 is now available for pre-order. We couldn’t be more excited to get the first book in The Indigo Project trilogy out there! Michael Cammarata is thrilled to announce the launch of his book publishing company, RO Books, and his new partnership with major distribution partner's Inscribe Digital and Independent Publishers Group. 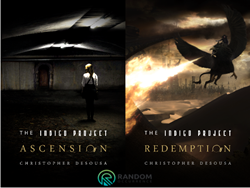 As its first course of action, RO Books will globally release 'Ascension: The Indigo Project' on April 1st with radio and press tours to follow. “We couldn’t be more excited to get the first book in The Indigo Project series out there,” Cammarata says. “Our future readers are everything to us, we look forward to connecting with people worldwide and hope they like our stories as much as we do!” Cammarata has also been involved with the series creatively working with the books team of writers grabbing a co-creator title in the process. “The Indigo Project is a YA action, adventure, fantasy, sci-fi trilogy dealing with Egyptian mythology and alien entities,” Cammarata says. No stranger to the entertainment business, Cammarata prior to launching Random Occurrence managed Nickelodeon's Big Time Rush. BTR is known by millions of fans worldwide and ranked within the top 10 programs on Nickelodeon in key markets including Germany, Mexico, Korea, Brazil, UK, Argentina and Sweden, and is seen in 78 territories and in 17 languages via Nickelodeon channels and syndication. Now, an ever-growing entity in his own right, Cammarata is bracing for a big year. He is currently serving as a Chief Global Strategist overseeing all of his holdings such as the new star of the natural products world Schmidt's Deodorant. Endorsed by Alicia Silverstone and as seen on Fox News, NBC's Today Show, and the Hallmark Channel Schmidt's is currently the fastest growing company in its category and available at thousands of retailers worldwide. Cammarata was raised in Lloyd Harbor, NY overcoming dyslexia at a young age only to become a technology and marketing wonder-kid generating over $85 MM in revenue by his late teens. Currently supported by a staff of seasoned and creative professional’s Michael and his team are always looking to whats next.